"Wilde in America" by David M. Friedman. When he arrived in America for his 1882 lecture tour, the Irish writer Oscar Wilde had published only one small volume of poetry (most critics thought it derivative). Only 27, Wilde had been promoting the idea of himself since university (where he had the thrilling good luck, author David M. Friedman writes, to be “condemned in a sermon at a nearby church”). A minor London celebrity for his outlandish wardrobe and affected languor (“he would hail a cab to cross a street”), Wilde was the model for the aesthete fop Bunthorne in Gilbert and Sullivan’s “Patience” (his tour was conceived as advertisement for the play). American papers mocked him as an “assthete,” but he made for great copy: He pronounced his disappointment in the Atlantic Ocean and Niagara Falls, but was genuinely charmed by the hospitality he encountered in places like Leadville, Colo. (where he admired a saloon sign reading, “PLEASE DO NOT SHOOT THE PIANIST. HE IS DOING HIS BEST,” calling it “the only rational method of art criticism I have ever come across”). By the time Wilde left nearly a year later, he was a celebrity. 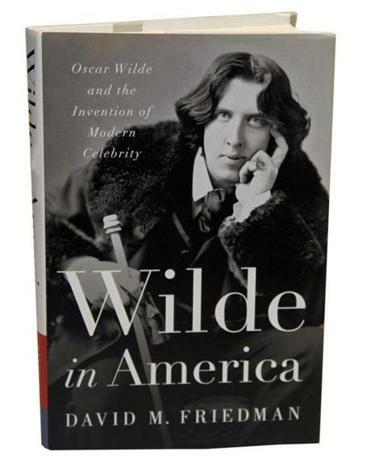 Friedman argues in this smart, entertaining new book that Wilde in fact created “a worldview where fame isn’t the end product of a career but the beginning of one,” thereby providing a blueprint for the modern American idea of celebrity. When the writer Henry James met Wilde, he hated what he saw. As Friedman puts it, for James, Wilde’s self-authored fame heralded “a repugnant and alien future: an age when the talent that mattered most wasn’t artistic but narcissistic — a genius for self-puffery and public preening.” He had no idea. The role of the goon — more politely, the enforcer — lives in hockey’s DNA, part of the fighting culture that some fans adore, others bemoan. “[N]obody dreams of playing hockey so that they can hurt other people,” Branch points out, but a treasured goon can become a team’s most beloved member. As intimidating he was on the ice, Boogaard was sensitive, gentle, fragile even — and totally unable to protect himself from the physical damage he’d endured, “one subconcussive blow at a time.” Branch’s book began as a series of articles in The New York Times following Boogaard’s death at 28 from an accidental overdose of alcohol and pain medication. In expanding, the story veers close to travelogue, bouncing around small Canadian hockey towns, but loses none of its power in exposing the violent tradition that pushed this young man to the brink. Books about dogs “are invariably dismissed as sentimental and lighthearted, lucrative but simplistic, the lowest form of literature,”writes Mikita Brottman, in what could be read as an attempt to preempt criticism of her own volume. “Grisby the Great,” though it is lighthearted at times, isn’t simplistic in the least. Brottman writes amusingly and often movingly of the relationships between dozens of writers and artists and their canine friends, along the way exploring her own devotion to Grisby, a charismatic if at times bumptious French bulldog.